Char. cloth, punkwood, etc. how do YOU do it? Well, I used some of those cotton round make up remover pads. I put them in a candy tin with a hinged lid.3 stacks, not sure how many to a stack. I did not punch any holes in it. I threw it in the woodstove along one side in hot coals but out of the fire. Not sure how long it was in there. 15 minutes to half an hour. I forgot to take it back out.LOL! Re: Char. cloth, punkwood, etc. how do YOU do it? I used an Altoids tin and some Levis jeans cut to fit the tin. I crammed them in till it barely closed; maybe 20 layers? I forget. I put it in a small bonfire and took it out when I saw the white smoke stop. I had punched a small hole in the lid with the awl on my SAK. I also did it with a piece of very, very dry, light pine. I split it with a knife and cut it with a saw until it fit in the container. It took a lot longer and the charcoal took a spark well, but it was very brittle and was prone to crumbling into dust when handled. I do pretty much the same thing too. Stuff a tin full of cotton cloth and roast it till not much smoke. I dont think it really matters if your tin has holes or not. I haven't had the best of luck with charred wood but that is probably just me. If you are throwing sparks and your charred cloth is decent, it should work just fine. You can for sure over cook your char, when you do, it will not catch a spark. It's one of them things that seems simple but you do have to pay attention to the timing. Once it stops smoking you need to get it off the fire then let it sit to cool off. Don't open it until it cools, doing this should give you some good char. One more thing, if you load the tin heavy it may not char all the material. It's best to put just enough in the tin but leave some room so it chars all the way around...something you will learn on your own just by doing it. The best material I've found for charcloth are old bath towels from the thrift store. They're cheap, thick and hold up well when I hold it on my quartz to strike. Just make sure they are 100% cotton! Being thick I put 2-3 pieces in an altoids tin to get a good even 'char'. I have also made a tin of charred punkwood. I just place the full tin of charred punkwood on the ground, as close as I can get it to my fire prep/ring setup, strike a spark into the tin and when I get a good ember I just place my birdnest on top of the tin and blow it into flame. When it bursts into flame I pull it off and away from the tin and continue feeding it as usual. 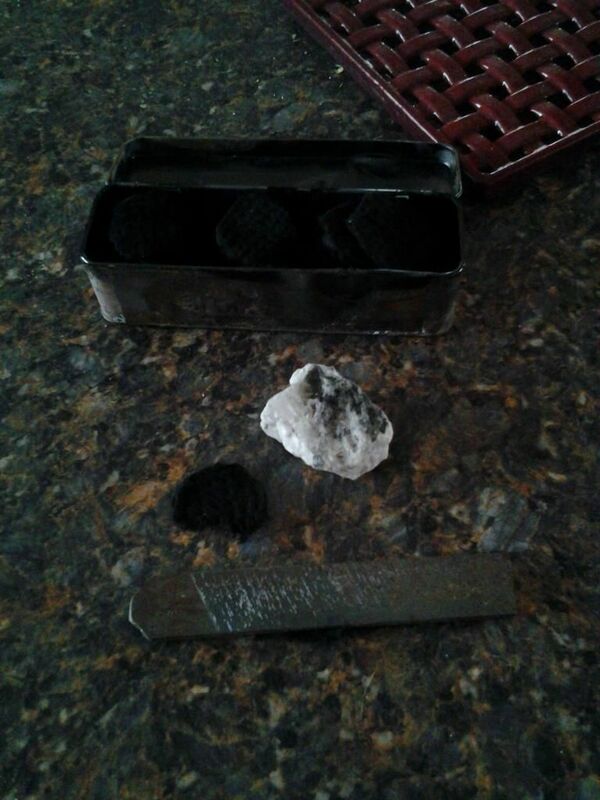 I close the tin and the ember(s) will go out from the lack of oxygen. The tin that I store my punkwood does not have a hole in the lid. Kenneth Kramm (I call him the 'Mr Rogers' of bushcraft, lol, uses this technique alot on his Youtube channel. Putting a hole in the tin makes it easier to see the smoke, plus you can see when the smoke stops...just makes it a little easier to read the smoke. Sometimes you get a smoke tornado that's kind of cool to watch. I charred some punk wood and tinder fungus MnSportsman gave me a while back, mixed with some charred juniper bark. The charred fungus took the spark the best, which is no surprise since it will take a spark before it's charred. It worked well once I got the hang of throwing sparks into a box instead of doing the char on top of the flint method. It think it's worth becoming proficient with both methods. I have to agree as some char you just can't hold on to it. Offtrail, you might be right. It does come apart kind of easy. I'll have to see what the middle pieces look like. Our wood stove is a fireplace insert. Because of this there is not an ash trap. We can not let it burn out and scoop the white ash out. it's too cold. We end up with about 4 inches of hot coals that impede the area for fresh wood. All of these hot coals are burning bright orange. we scoop them out and put them in a large aluminum pot and cover with a large paver stone. It sits on a large capper block. My wife takes it out and dumps it in our fire pit. Now the pit is VERY full. I am just realizing that it's entirely charcoal. If it doesn't smother out with the stone on top she dumps water on it. It goes from bright orange to cold and black. .......be good in the ol' tinder box, too, I'll bet! Charcoal is made the same way as charcloth, Heat wood with lack of oxygen= charcoal. I've recently taken a cue from Mr. Keith Burgess in the videos below and started to use charred punk wood. I'm still a newbie at any of this, but I think it has some marked advantages in the field over charred cloth. For one, you're using material that you can find pretty easily in the woods instead of cloth, which would most likely be coming from your own clothing if you needed to make more. Also, the charring method for punk wood is, imho, easier and takes a lot less time to do. I just started doing this so I may at some point change my mind, but so far it's working for me. Any thoughts from more experienced flint-and-steelers? In the char cloth challenge I struggled. I came looking for tips, information.- like, can char cloth go bad? I used an old towel like Nature Boy. When I first made it a couple weeks ago it worked real easy, now it seems much more resistant. It's just been laying around indoors, in the tin w/ tiny hole. I have also watched numerous vids by Mr. Burgess. I have tried, practiced with char pinched to the flit/striker in the right, obviously I need a ton more practice. Many things Burgess said struck a chord with me. I had always been frugal with my cloth so if I got a spark there might not be enough to light the kindling. Or start with a bigger piece and beat the crap out of it trying to spark it, same result. What he is doing here really made sense. The punkwood I have charred has worked well(until yesterday) I could see sparks hitting both chars but none would take, until finally a big enough, hot enough one landed I suppose. The punkwood is sitting outside in a large tin I thought maybe it had absorbed some moisture. Maybe it was just a bad day? One of the concepts for PW's challenge was conserving your tinder. Which is very much the way I looked at flint and steel as I said. If I burn up my box full trying to start a fire, how will I make more? I had my saw handle wrapped in T-shirt cordage with the idea of using that as needed. Never really did it because I had pretty much given up. After watching Burgess' stuff I got interested again. If I am striking into the box a wayward shower of hot sparks has a bigger target. I can usually get it quickly, or quick enough to not beat my flint into shards. If I keep adding fresh punk as he suggests I might never run out, or just make more with every fire. I'll keep at the the other way, I'd like to be able to light my pipe as easy as the guys in char challenge vids got their cloth lit, but I'm not there yet. May be a rambling post, probably me, and not the char that went bad. The hole in the Altoids tin doesn't matter, I've tried it both ways and it works the same without one. The lid doesn't seal tight anyway, if it did the gasses would blow it open. Charcloth doesn't go bad, even when it gets wet. MnSportsman has a video on the topic. Flint does get dull and throw weaker sparks, however. One more caveat.......Try and get your char & tin as close to the origin of the flint/steel spark as you can. The farther it has to travel through the air, the less hot and shorter-lived it will be, as it makes the trip through the air, to make contact with the char of choice. I've been using charred cattail both loose and whole for the last year. I pack the cattail tight in a tin when charring. I use Mr. Burgess method of throwing a shower of sparks in the tin. I find the charred cattail lights better than punk wood. The best for making char cloth is old 100% cotton Levi or Wrangler jeans. I cut up the legs into pieces that fit in an Altoid tin.